Wait, My Menstrual Cycle Is Contributing to Environmental Degradation? I know this not a topic that everyone wants to talk about. However, it has been a fact of life since the beginning of time. The average woman menstruates for 38 years in her lifetime. Unfortunately, in today’s world, 38 years’ worth of menstrual cycles translates into a lot of waste and energy. To be exact, there is approximately 62,415 pounds of sanitary products that end up in landfills. Not to mention the countless tons of fuel that goes into producing these necessities. The truth of the matter is that sanitary items are one of the most unsustainable used products. In North America, over 20 billion pads and tampons are only used once before they are tossed. But how exactly do sanitary items hurt our environment? Since most pads and tampons are made up of conventionally produced cotton, there has already been damage done before it even reaches the store self. Conventional cotton farmers usually treat the cotton with toxic pesticides such as aldicarb, phorate, methamidophos and endosulfan. These chemicals are harmful to the people working with them and wildlife. Once sprayed, these toxins often move through the air to other nearby communities contaminating water sources, killing soil micro-organisms, bees, and other beneficial insects. 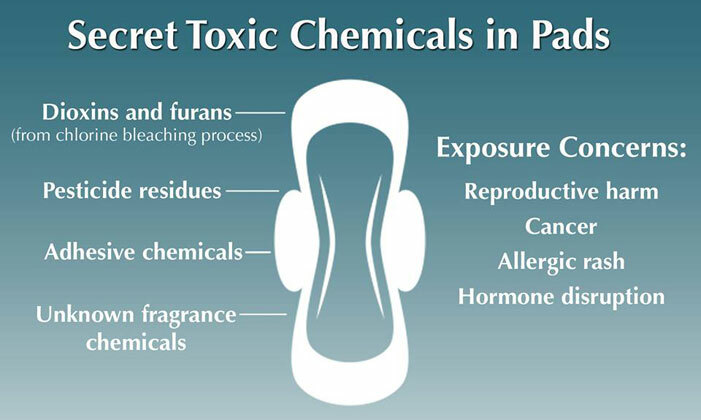 This image displays all of the toxic chemicals that can be found in pads. Also, most of the cotton is then bleached with chlorine gas. Once the cotton bleached chlorine enters a landfill, it becomes deadly to organisms living in water and the soil. Another harmful chemical found in most sanitary products is called dioxin. Dioxin is a carcinogen that over time accumulates in the food chain. Within an organism it can trigger biological effects such as hormonal disturbances and alterations in cell functions as well as adding to the risk of cancer, diabetes, heart disease, high blood pressure, and liver damage in humans. It’s not only the cotton that’s harmful, but it is also the plastic applicators and the plastic wrapping. The manufacturing process of producing these disposables consumes a lot of energy and nonrenewable resources which contributes to global warming. Most disposable pads and tampons are made from 90 percent plastic derived from crude oil. When crude oil based plastics reenter the environment it releases large amounts of toxic pollutants which ultimately leads to devastating damage to wildlife and the natural landscape. Combined with other super absorbent materials, the manufacture of sanitary items releases greenhouse gases: nitrogen oxide, sulphur dioxide, and carbon dioxide which are causing our planet to heat up. I too was shocked to realize that not only are these feminine products not good for the environment, but they are also harmful to my own health. Fortunately, there are healthier and eco friendlier alternatives. Natracare is a company that produces organic chemical-free pads and tampon. These products are more eco-friendly because they are bio degradable and do less damage to the environment since they are bleached without harsh chemicals or sprayed with pesticides. 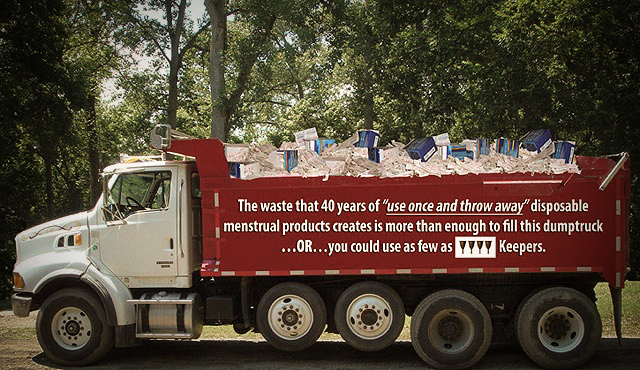 This image shows how 4 menstrual cups can replace a truck load’s worth of sanitary waste.